"Andrew Dornenburg and Karen Page are accomplished authors, respected food authorities, and industry leaders with exceptional talent and vision in writing some of the industry's most well-respected books." "Andrew Dornenburg and Karen Page's books have enriched the fount of culinary knowledge. They move the culinary culture forward thoughtfully and intelligently....They've done a marvelous job of making the history, culture, and even science of food compelling." 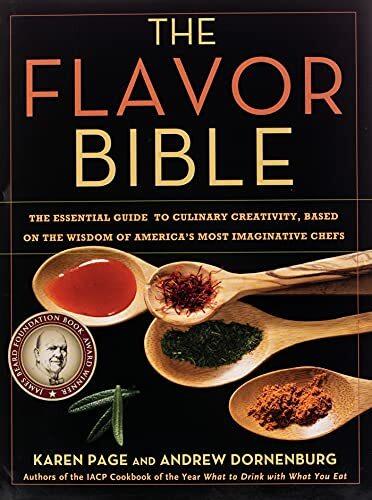 An essential companion to the authors' bestselling WHAT TO DRINK WITH WHAT YOU EAT (food and drink pairings) and CULINARY ARTISTRY (classic flavor pairings), THE FLAVOR BIBLE is a groundbreaking guide to modern flavor pairings that can revolutionize the way you cook. "Thanks to [their] seemingly insatiable appetites and exhaustive taxonomic energies, the authors have shed new light on the art of pairing, ensuring...a book's worth of peak experiences." "As with their previous books, this husband-and-wife team has researched their subject exhaustively...to put together the definitive pairing guide." "The most exciting and comprehensive guide to wine pairing that I have ever seen." "My most-used cookbook: CULINARY ARTISTRY by Karen Page and Andrew Dornenburg." "My favorite cookbooks: CULINARY ARTISTRY and El Bulli." "Of all the cookbooks I own, this is the one that I reference most." Used and new books. General topics - fiction nonfiction. Childrens books. used and out of print.